The Microdesk Document Holder and Writing Surface provides an elevated secondary work surface directly between the keyboard and the monitor. 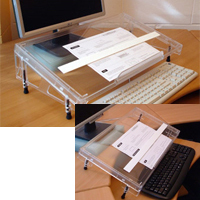 Made of transparent, heavy-duty plastic, the Microdesk is designed to straddle the rear edge of the keyboard, creating a stable, sloping platform for hand-writing tasks, as well as support for documents, books, mobile devices and other workstation essentials such as calculators or sticky notes. By allowing simultaneous inline access to materials and to the keyboard, this multi-function accessory enhances workstation comfort and convenience. Users can avoid the discomfort of twisting to the side, or of reaching over the keyboard to write; or the inconvenience of having to move the keyboard aside whenever they want to jot down notes. The Microdesk Document Holder and Writing Surface comes in two sizes--Regular (22" x 12") and Compact (17" x 12"). Both sizes have non-slip feet and can be adjusted for height and incline. Included are two removable paper ledges (10" long x 0.25" high or 10" long x 0.75" high) to support even the thickest stacks of paper (up to 100 pages), and a non-slip ruler/line guide. The 22" Regular Microdesk will accommodate most standard-width keyboards. The 17" Compact Microdesk will accommodate compact keyboards, mini keyboards and combination/all-in-one keyboards up to 15.75" wide. Note: Height restrictions apply. Please see Usage Tips for information on using this product with splayed or tented keyboards, or with contoured keyboards such as the Kinesis Advantage keyboard. Two different pairs of side accessories—Standard and Step—allow the Microdesk to be used either on a desk top, or "stepped down" with the front legs on a keyboard tray and the rear legs on the desk top. The Standard Side Accessories create the comfortably sloped surface of the desktop configuration. The Step Side Accessories configure the Microdesk for use with a keyboard arm and tray. Note: Both pairs of side accessories will work on the desk top; however only the Step Side Accessories can be used with a keyboard tray. The stepped down configuration can be especially useful for those working with low monitors and for those who wear progressive lenses. Standard Side Accessories are included by default with all models (MD-REG-STD, MD-COM-STD, MD-SS). Step Side Accessories are included by default only with model MD-SS. The Step Side Accessories are an optional add-on to the MD-REG-STD and the MD-COM-STD and must be purchased separately. Le porte-document et surface d`écriture de Microdesk fournis une deuxième surface de travail élevée directement entre le clavier et le moniteur. Fabriqué en plastique transparent et robuste, le Microdesk est conçu pour chevaucher le bordure d`arrière le clavier, pour créer une plate-forme stable et inclinée pour des tâches d`écriture, aussi que soutenir les documents, les livres, les appareils mobiles et d'autres nécessités de poste de travail comme calculatrices ou feuillets autocollants. En permettant l'accès en ligne des matériaux et du clavier simultané, cet accessoire multi-fonction améliore le confort et le commodité du poste de travail. Les utilisateurs peuvent éviter la malaise de se tordre vers le côté, ou de s`étirer au-dessus du clavier pour faire l`écriture; ou l`inconvénience de déplacer le clavier à part pour prendre les notes. Le porte-document et surface d`écriture de Microdesk est disponible en deux tailles--Standard (22 po x 12 po) et Compact (17 po x 12 po). Les deux modèles viennent avec des pieds non glissantes et sont ajustables en hauteur aussi qu`en pente. Inclus avec les deux modèles sont deux rebords démontables (10 po de long x 0.25 po de hauteur ou 10 po de long x 0.75 po de hauteur) pour soutenir les piles de papier épais (jusqu`à 100 pages), et une règle qui est non glissante. Le modèle Microdesk Standard de 22 po est compatible avec la majorité de claviers de largeur standard. Le Microdesk Compact de 17 po est compatible avec les claviers compacts et minis, ou les claviers tout-en-un (clavier intégrals/combo) jusqu`à 15.75 po de largeur. Veuillez Noter: Restriction d`hauteur s`applique. Veuillez voir s`il vous plait Les Conseils d`Utilisation pour de l`information concernant comment utiliser ce produit avec les claviers évasés ou sur une tente, ou avec les claviers de 3D comme le clavier de Kinesis Advantage Contoured. Les deux modèles, Standard et Compact, du Microdesk peuvent être configurés en deux mannières. Avec l`Accessoire Standard Side, inclus par défaut, le Microdesk peut être soutenu complètement sur la table. Avec l`Accessoire Step Side installé, le Microdesk peut être soutenu devant par la tablette de clavier, et derrière par dessus du bureau. Cette configuration étagée peut être utile pour ceux qui travail avec des moniteurs qui sont placés particulièrement plus bas (puisque ça ne vas pas cacher le moniteur) et pour ceux qui ont des verres progressifs. Veuillez Noter: Seulement le Standard Microdesk (22 po) est disponible avec les deux Accessoires Side inclus par défaut. 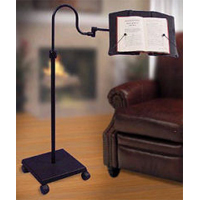 The BOOKPOD book holder from Genio is a versatile and portable book holder for everything from textbooks to sheet music to cookbooks. When closed, it's small enough to fit in a backpack or laptop bag, and can be used for storing pens, pencils, calculators and other essential items. 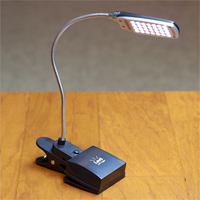 It opens quickly and easily, providing ergonomic positioning superior to laying documents on a flat surface. 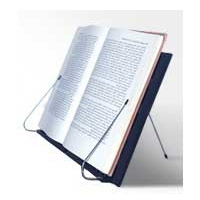 The page holders are sturdy enough to keep hardcover textbooks open, and will securely anchor single sheets of paper as well. 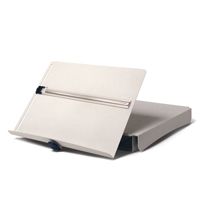 The INZONE Documentholder IV from Sun-Flex is a highly advanced inline metal document holder. 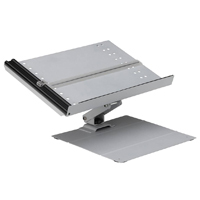 The easel can be rotated 180° which allows you to use this accessory as an inline document holder which is cantilevered below the desk surface, to occupy the space from the bottom of your monitor to the top of your keyboard. This helps avoid uncomfortable twisting of the neck and shoulder muscles when working with documents. It includes a plastic line guide with magnifying feature and expanding aluminum line guide track which securely holds reference material from a single sheet to a 0.9" thick stack of paper. 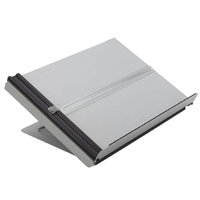 The construction of the INZONE Documentholder IV is of high grade, heavy duty steel sheet metal and painted with a matte powder coating silver finish to avoid reflections. 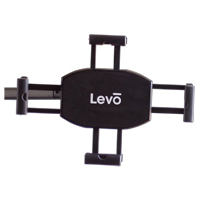 The LEVO Dual Clamp Tablet Cradle for LEVO G2 Tablet Stands is an ideal replacement for LEVO's Bungee cradle/platform. It works with any size tablet up to 12" (from iPad mini to iPad Pro), including the tablet's case (except for the iPad Pro). The clamping ends are also removable in anticipation of different shapes for future tablets. Tablets are easily secured to the clamp with the easy slide of a lever on the back of the clamp. 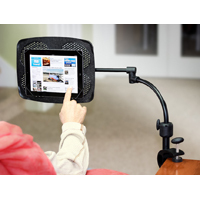 It is designed so that you can attach or detach your tablet in seconds. In some cases, the clamp will also hold many smart phones.